If you are white and enjoy any level of public platform—politician, professor, policy wonk—and you use said platform to address social issues, you are certain to be accused of seeing life through the distortive prism of white privilege. Black leaders and social justice firebrands will make the allegation in the most austere terms—witness that spicy moment during a recent debate on political correctness when Michael Eric Dyson bluntly labeled his conservative adversary, Jordan Peterson, a “mean, mad white man.” Even those on the Left, such as Hillary Clinton and Bernie Sanders, have not enjoyed immunity from this charge. Privilege is framed as a condition that, once acquired, can never be cured. However, it defies credulity to propose that Dyson and other leading social justice voices are alone in seeing life for what it really is, stripped of all parochial subtexts. Common sense suggests the existence of a complementary malady afflicting the accusers: racial paranoia, one might call it. If some are inclined to miss the unfairness around them, is it not equally possible that others see unfairness where none exists? Nowhere in the public arena do paranoia and privilege collide more explosively than on the topic of unequal treatment under the law. In making their case, black advocates uniformly cite the videotaped incidents that by now have become an eponymous part of the national conversation on race: Eric Garner, Walter Scott, Philando Castile. All gave oxygen to Black Lives Matter, and later to the NFL’s take-a-knee protests. Surely videos can be dramatic exhibits in mounting a case for extrajudicial violence. What a video cannot do, of course, is show us whether excessive force is excessively applied or racially motivated. For that we must turn to facts and figures. Even without such adjustments, the raw numbers are telling. In 2017, American cops killed 19 unarmed blacks. There are 30 million blacks over age 18 living in America. The 19 killings thus represented a death rate of .00000063333—less than one ten-thousandth of 1 percent. Nothing can be deduced from a sample that small. Across the spectrum of America, random events take a much higher toll. In one recent year, 84 people died after being mauled by “a mammal other than a dog.” Each year some 340 Americans die in their own bathtubs. If this year half of them are black—well above the expected distribution, given blacks’ Census representation of 13 percent—we would not investigate whether bathtubs had developed racist tendencies. We might, however, adopt a commonsense behavioral lens, investigating whether any new behaviors were exposing blacks to greater danger at bath-time. Interestingly, such reasoning is considered impolitic in assessing contacts between blacks and law enforcement. As a society, we are seemingly proscribed from ascribing black misfortune to black causation. In any case, police unquestionably target and hassle blacks much more often than they do whites, right? Not so fast. In the Police-Public Contact Survey (PPCS), conducted semi-regularly by the Bureau of Justice Statistics (BJS) and based on a sample of some 60,000 US residents aged 16 or above, respondents describe their recent police encounters. Both blacks and whites are overwhelmingly approving of police conduct, resulting in but a minor difference in the perceptions of the propriety of their respective stops: 83 percent approval for blacks, 89 percent for whites. Although whites also appear to benefit from a modest imbalance in the use of force, force is surprisingly rare overall, occurring in just 3.5 percent of contacts for blacks and 1.4 percent for whites. Keep two things in mind here: One, this includes some percentage of encounters where force was required to apprehend a suspect or stop a crime. 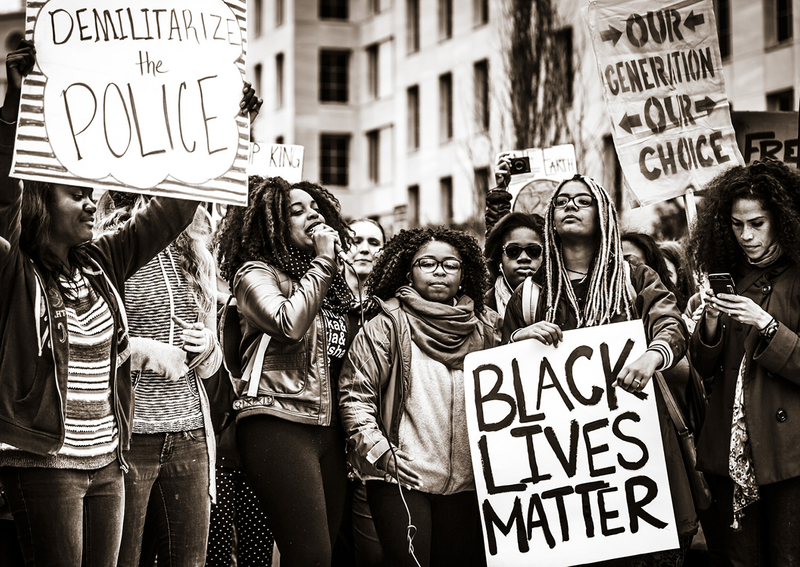 Two, for the purpose of this analysis, ‘force’ encompasses such relatively benign practices as “shouting, cursing, threatening, pushing or grabbing.” Finally, for all the anxiety over the supposed metastasizing of ‘stop and frisk’ policies throughout society, there were no statistical differences between blacks and whites in the frequency of street stops—less than 1 percent for both. How does it happen that a young man is miscast as the poster boy for a malaise that doesn’t exist? One might argue there are three factors in play. The first, unsurprisingly, is mass media, with its sensationalized wall-to-wall coverage of incidents that do occur. The second is the spectacular valence of so-called Black Twitter, with its exponential multiplier effect. The third and newest factor is the ascendancy of a phalanx of African-American authors, who have a developed a perverse interest in the commodification of racial pain. They include Mr. Dyson, the New York Times‘s Charles Blow, columnist Leonard Pitts Jr., Marc Lamont Hill, and the much-celebrated Ta-Nehisi Coates. Collectively they cook up for their hungry audience a distasteful stew of slavery, Jim Crow, KKK lynchings, mass incarceration, the emergence of the ‘alt right,’ and—above all—the primacy of so-called ‘lived experience.’ Think of the psychic damage done to their audience by this never-ending immersion in white malfeasance. And so I will close by making a a simple request of Mr. Dyson and all purveyors of such unremitting racial grimness: check your paranoia. The US has the highest incarceration rate in the world, the greatest military spending, onerous fines in poor communities, a very high rate of police killings, a very high number of mass shootings, plus non-stop war. Forget about the 19th century quack race analysis, and maybe people are paranoid because the US is objectively a very violent society. Rosa, you list the effects without understanding the causes. Why do you think the US has the highest incarceration rate in the world? Could it be because of immigration and the rise of childbirths out of wedlock? What were the causes for the US to have the greatest military spending? Could it be because of our geopolitical situation in the post-WW2 era? What are the cause for a hight rate of police killings? Could it possibly be because of immigration and the rise of childbirths out of wedlock? What are the causes for mass shootings? Could it be because the vast majority of school shooters are fatherless? What are are causes of non-stop war? Even then, in the grand scheme of things, we are living in the most peaceful and prosperous time in history. The US may be objectively very violent, but it is still the best country on earth in history. With all that being said, there is no doubt room for improvement. But your nihilism and unrestrained empathy are toxic to progress. Immigration and children out of wedlock as the major cause for police violence? Where do you live? Look into other parts of the world! High immigration and children out of wedlock in Europe. Much lower rates of police violence, mass hootings, criminality etc. What about unrestricted gun possession? He didn’t say immigration and children out of wedlock are a major cause of police violence. He specifically said of incarceration. There have been academic arguments, for example, that one reason for the high incarceration in the US is due to the diversity of financial status along two views: 1) the greater diversity in economic status results in greater crime since there is more to steal, for example, or greater envy across class lines and 2) there is greater incarceration due to greater GDP which allows for bigger government and greater enforcement expenditure (poor country spends less on law enforcement so fewer cops/prosecutors per population measure — so the parallel is 90% of people exceed the speed limit but very few actually get ticketed). @Markus, I can’t speak for others, but I, for one, am always down for a good mass hooting. I assume this is something like a block party…. It’s hard to take anything you say seriously if you can make a statement like that one. You should probably leave and see somewhere else then if you can’t take that statement seriously. I wouldn’t put it so…Trumpy. But it’s not hard to believe if immigration counts as any survey – and it may be the largest and most accurate by a mile. Even those Americans who threaten to leave every four years (for Canada, unsurprisingly) never do. Even now, when sympathetic understanding would be at a 100 year high, my own included. Rosa, in the process of mindlessly parroting your leftist talking points, you conveniently forgot to include the number one killer in America, especially of black lives: legalized abortion. I fail to see how a lefty can have a consistent stance on non-violence while rabidly defending the right(?) of some people to kill unborn babies. This discussion is not about religion-inspired anti-abortion propaganda. It is about violence between people. Markus, you are clearly operating from the diametrically opposed premise that an unborn child is not a person with a natural right to self preservation. From my perspective, the unborn child is a person and killing it constitutes violence against a person. If that is not violence than I fail to see what could possibly constitute a violent act in your estimation. Markus, you are clearly operating from the diametrically opposed premise that an unborn child is not a person with a natural right to self preservation. Self preservation? You are going to give guns to foetuses? Is the woman carrying the child a person with rights? At what point does the fetus become a person? I would tend to give a full grown person more rights than an barely developed fetus. @aa when did “don’t hurt peaceful people and don’t take their stuff” become leftist talking points? If you get cancer, remember: those cells have a pulse, and they’re part of God’s plan. When university professor is accused of “violence” because he asserts the government should not be dictating pronoun use, who is a peaceful person? When people pay for liberal education but instead get a progressivist indoctrination, whose money is not being taken? Conrad, your lack of moral probity is on full display when you make the very unhelpful equivalence between an unborn child and cancer… I don’t think that is deserving of a thoughtful response. Maybe you are not familiar with American political discourse? Each of the ambiguous claims made by Rosa are the standard leftist narrative of everything that makes America horrible compared to other countries. Of course this narrative is at direct odds with the reality that America is a damn good place to live. If it is indeed such a racist and violent country, why are so many minorities and law-abiding people clamoring to get in? The overvalued dollar is the main cause, not only for immigration, but also for cheap imports. I understand that short-term cheap and foreign, sustained by military power and a corrupt financial system, gives many Americans the illusion, for now, of a good life. Bless! @ Rosa, explain to me why millions of people want to move to the US. And for the love of God, present some statistics. Compare the killing rates between Honduras and the US…for example. And explain it. Facts Rosa. It’s all about facts. Google, Johan. It’s all about google. If I misstated the US’ world position in any of these categories (not others, such as murder rate and abortions), then we can talk. Maybe, just maybe, America is a great place to live, not in spite of the fact that we have high incarceration and high military spending, but because of those features. He primary thing that separates us from your typical South American country is that we have laws and we actually enforce them energetically. If this means that we have to lock a lot of people up in order to avoid becoming overrun by violent criminals, then do be it. The alternative is Honduras, El Salvador, Mexico… we can all see what ravages and social ills are created when a country lacks the rule of law and the resolve to punish its criminals. I hear the leading candidate in Mexico’s presidential race is now suggesting that the leaders of drug cartels should be given amnesty. It’s exactly that lax on crime mindset that makes these countries cesspools of organized crime to begin with. Criminals in Mexico literally have nothing to fear. In fact there is a perverse inversion where the law abiding citizens have more to fear than the criminals. Just in this last election cycle, 131 candidates were killed, usually in broad daylight, for speaking out against crime and corruption. AA: I accidentally gave Kevin Herman the kudos that I meant for you. Thank you for this post. It doesn’t blow my mind at all to read an admission that the US’ exceptional position in the world is based on military expenditure. Everybody knows that. You forgot to mention, however, the corrupt American banks where all the money made by all those foreign criminal drug lords is laundered. Maybe that non-energetic law enforcement, amnesty, and laxity that you so well describe is also a factor in making the US a great place to live? Please be seated for this may blow your mind, but the US was saved from imploding in 2008 by the only source of liquidity available at the time: criminal cartels’ dollars. The US’ exceptional position in the world is also based on it being the center of a corrupt financial system. But you, personally, live comfortably so all is well. At least until the next crisis. Pretty low bar to be better than Honduras. Try comparing the USA to Sweden, Norway, France, or even Canada. By almost any objective Standard all of these countries are better places to live than the USA. Law and Order is important to have a ‘good’ country, but the level of incarceration you see in the USA is well beyond what is required for the rule of Law. Some people aren’t going to like this but I don’t care quite frankly. I have spent the vast majority of my 45 years on the planet living in a working class area that has always been at least 50% black. I’ve had many black neighbors and friends. Most of the problems between the police and black people lie squarely at the feet of black people. Most black people are brought up from day one, before they ever have contact with the police, to hate and fear them and to be disrespectful to them. Of course there are bad racist cops there are bad racist people of all stripes. But imagine working an inner city beat where 80-90% of the calls/stops you get involve black people. Then imagine in a lot of those case you are treated with disrespect or with a flat out refusal to follow legitimate police commands. Its a recipe for disaster. Its like what came first the chicken or the egg. Sure sometimes the police stop black people for flimsy reasons but part of the reason is because of all the crime they commit. These cops aren’t stupid after awhile they have a good idea what constitutes normal behavior is in these areas. Sure sometimes its an innocent person get harrased for no reason but to me the main problem is the rampant criminality in the black community. They need to get real with themselves and stop committing so many crimes. The real issue is all the crimes black commit not racist police brutality. I couldn’t agree more. However, we need to put race behind us, and start putting American values first. I don’t care if you are black, Asian, White, Indian, if you hold certain Enlightenment truths as self evident you are more American than most. That is what really should matter. To put race behind us?? That sounds Martin Luther King! In the meantime, we firmly arrived in the epoch of identity. Without that, you can’t speak with any credibility these intersectional days. But this can change soon enough, of course. It all depends! Kevin Herman, thank you. That is the best defense I have read against accusations of over incarceration. I think that if I was a cop, I’d be most suspicious of the people who were a little too eager to ‘obey’ my commands. Innocent people, as a simple matter of human nature, don’t like being threatened and told what do do … ‘because’ they haven’t done anything wrong. If ‘flat out refusal to follow legitimate police commands is’ is such a problem, maybe they need to rethink how they police. Fewer commands and a lot more questions would be a good place to start. @ Zach Tollen…Great work finding that quote! Race pimps of today are of the 5th generation! Follow the money. If you want to find the source of a long standing problem, then find who benefits from it. In this case, that would be the activists and politicians. It’s honestly, a perfect job, to cash checks for doing something, society views as virtuous. I’ve found myself far more skeptical of all activists, once I realized, that they have very strong incentives to for there, to be as much perception of wrongful doings, as possible. It’s bread and butter on their table after all. “Follow the money.” Incredibly shallow to suggest financial motivations, right or wrong when it comes to causes people are almost always in it for what they believe in at the deepest levels. I admit, it’s certainly shallow – the issue is complex, and I’ve written one paragraph on it, which was more emotional, then factual. But I do think we shouldn’t ignore financial and social incentives involved in the issue. An organization that has all the incentives to identify any event as racist and no incentives not to, would naturally seek to identify as many events as racist, as possible. The society too easily writes a blank check for anybody, claiming to advance ideas of compassion, equality and justice. If social activism watches for social injustice in our society, then who watchers the watchers? I think we need to pay more attention to the biases of charities and activist organizations. It’s not like there are no examples of charitable organizations, shamelessly using good will of people to line their pockets or advocate ideas without suffering any negative consequences from their implementation. BT Washington was way shallow? Ok.
I’ve worked in NGOs and lived in areas where they operate. With a handful of exceptions they mostly benefit the elites running them and have an amazingly dismissive attitude to the people they are “helping”. Talking about pay gaps! The people running them clearly think they deserve to be paid on a totally different scale than the locals. They will buy a new luxury “business” car while handing out a pittance to the poor. Just writing a check is unlikely to help anybody except the middlemen. It is false charity. You need to dedicate a little time as well and get to know people in need and help them directly if you actually want your money to go to them. Don’t tell me 90% of the money goes to programs. This can be fudged in every way. These high energy physicists have the ability to create large numbers of particles to produce robust samples, since most or all of the particles of a given classification are identical to each other, dramatically simplifying their statistics. Many of them are predicted by simple theory that lends itself to robust testing. The tiny sample of police killing events are each unique tragedies. Extreme outlier events with fundamentally unique attributes complicate rejection of null hypotheses. I’m optimistic that the charge of “white privilege” is less common outside the US, where the race obsession is ofter less ubiquitous. I think whenever you get people for whom race has become important that you get people who then have to find a justification for their belief that race is important. Whether it’s white supremacists or those whom espouse the evils of “white privilege” the simple attachment of such importance to race creates the foundations for a mindset that is of a racist predisposition. That article is too weak to serve as a foundation for the argument that Salerno is trying to make. Police shootings are relatively rare in the US, at least compared to deaths and injuries from all causes in a given calendar year. But that isn’t a cause for complacency–consider the huge financial costs to local governments when liability payouts occur. The city of Chicago, for example, pays out huge settlements to some victims of police violence even in the absence of a lawsuit. The liability issue can’t just be wished away. There is also another angle that is completely obscured in the Salerno article. Rather than use slip-N-fall accidents as a point of comparison, it makes more sense to compare victims of police violence to auto accidents caused by factory defects. The government typically requires auto makers to spend millions of dollars to remedy those problems, even if the number of persons killed or injured to date in the defective model is less than a dozen. Why is that, given that most auto-related deaths are due to driver error and not mechanical defect? In addition to the liability issue, part of the reason for recalls is that, if left unrepaired, these defective autos may be responsible for many more injuries and deaths in the future, given the typical longevity of a new car. Similarly, given that a cop on the street may be working for 10-20 more years, wouldn’t it make sense to give all police officers training in de-escalation techniques, including refresher courses? And cities could try washing out more cadets during police academy training. Or hiring more community-relations officers, etc. The racial grievance mongers play a large role in creating the liability issues. Weak lawsuits have settlement value when they can be tried in the court of public opinion and defendants will pay out to avoid the bad press. “….racial grievance mongers…” is a loaded phrase. I suppose that some Blacks with grievances are just looking for fame and/or fortune, whereas others, like Black Conservative–and Trump supporter–Louis Farrakhan, are actually True Believers in their cause. Because in the US, nearly every black person is the descended from actual slaves that lived in a slave economy (many states had majority slave populations kept in check by a terror state) and another 100 years of official abuse and denial of channels for wealth building. You need no a real racists today for this to.have strong group flourishing difference effects. That’s part of the story, sure. But what’s to be said of surveys where majority black response to negative influence of race on personal success is “no”, and negative influence of hip hop on culture is “yes”? How many black voices do we have to ignore before it contradicts our concern for the well-being of black people? And why aren’t poor majority white communities with all the same current excuses – obliterated by drugs and unemployment (and incidentally while a black guy was president) – as awash in shootings as empathetic left-leaning cities with far more wealth, opportunities, and resources? It seems we’ve reached a point where history’s influence has become negligible, and the perpetuated narrative that it has NOT only serves to foster criminality and keep certain politicians employed. I believe there is the paranoia you propose in the essay. I think the popular view among blacks is that whites get stuff without trying and all whites are rich. The fact that those whites who got ahead studied all their lives and work long hours is ignored. The fact that there are plenty of whites driving a taxi or stocking shelves at Walmart is ignored. Coates is particularly guilting of ascribing something close to magical powers to white people, an invisible force that gets them all sorts of benefits. Invisible, of course, because he can’t point to any mechanism since it doesn’t exist. Much of the downfall of the black community is due to the breakdown of the family. As Thomas Sowell points out, in the 1950s, a time when for sure blacks suffered from racism, black marriage rates, employment rates (though at lower wages) and incarceration rates were similar to whites. In a family of any race, if the father is absent the kids do much worse. I heard a story told by a black immigrant from Ethiopia. She was here standing in line at a water fountain (maybe on a college campus). The fountain was a funny one you held your hand under instead of pushing a button. She could only see that people bent over and got water. When she got to the front and bent over, nothing happened and she says she thought to herself “oh sure, white people can make it work” and then caught herself being paranoid. Peterson isn’t a conservative; he’s a classical liberal. I think a lot of this popular victimization consciousness stems not from legitimate societal ills (as this article refreshingly demonstrates) but from the latching onto false narratives that offer a means to feign indigence and to feel important. By railing against supposed injustices that are en vogue (regardless of their merit) you allow the lower aspects of our humanity to be galvanized and thus compensate for a lack of self-actualization. Conspiracy theories, especially a conspiracy that some racial or ethnic group plotting to destroy other ethnic or racial groups generally don’t have a lot of empirical support. However, they are very useful in politically mobilizing and motivating people on a Friends/Enemy spectrum. Paranoia is a personal characteristic. Racial and ethnic scapegoating is not paranoia, its a great way to build power and incite (and justify) racial and ethnic violence. It worked for Hitler, it worked for Mugabe, no reason it can’t work for “Progressives”. For what it’s worth, that’s not how statistics work. Assuming your sample is representative (i.e., random with respect to the population it is drawn from) what matters is the absolute size of the sample, not how large a proportion of the overall population it represents. That’s because the concern with very small sample sizes is that the sample will deviate from the overall population just by chance. And that chance declines rapidly as the absolute size of the sample increases. For example, if you flip a coin 10 times, you will very likely see a large deviation from 50% heads. But if you flip a coin 100 times it will wind up close to 50:50, and if you flip it a 1000 times it will be very close (because the random deviations in either direction tend to cancel out as the number of trials increases). This is true despite the fact that there are an infinite number of potential coin flips to be accounted for. Also, in this case, the sample would also not just be police killings of blacks, it would be all police killings. And then you would want to know whether blacks were overrepresented relative to their share of the population. It’s possible that using a single year would, in fact, provide to small a sample size, but there is also no particular reason to only look at a single year. (PDF) Xenophobia, fantasy and the nation: the logic of ethnic violence in Former Yugoslavia. Available from: https://www.researchgate.net/publication/267096739_Xenophobia_fantasy_and_the_nation_the_logic_of_ethnic_violence_in_Former_Yugoslavia [accessed Jun 25 2018]. What to do about the problem of Croatian privilege? There is a problem with this interpretation of Fryer’s data. The problem is, Fryer interpreted some of the forms as indicating the suspects gave officers “perfect compliance” when there was no field in the form to indicate perfect compliance. He is essentially saying that the officers reported perfect compliance on the part of these suspects — but used force anyway. It doesn’t make sense when you think about it. Fryer is essentially saying that the officers admitted they used force without justification in their reports. A more plausible explanation is that they sometimes failed to check the box for suspect resistance, as Heather MacDonald pointed out. I think there are 2 things operating here which mutually reinforce each other. 1. Social Justice Ideology encourages its adherents to be hyper aware and hypersensitive to instances of perceived injustice, no matter how minor, that support the metanarrative of systemic oppression. This attitude is justified by assumptions about the methodology required to change society for the better, and the style of activism conducive to that methodology. When it’s assumed that popular language, media imagery/text and political symbolism are key levers to molding social attitudes over generations, then the logic of “call-out culture”, strictly policing speech and art, and regulating the Overton Window of political discourse becomes obvious. Since all occurrences of oppression exist on a continuum described by the overarching Intersectional Theory of Systemic Cisheteronormativewhitesupramacistpatriarchy, no single event or interpersonal interaction can be evaluated in isolation, or decontextualized from the larger, monolithic oppressive system from which it is assumed to manifest. Of course, that political context is perceived to be so pervasive, its influences so inescapable, that it must be the main animating force behind all micro conflicts between individuals who belong to respective groups which are in meta “conflict” according to the Theory. Individual motives and behaviors cannot exist independently of these forces, since our very mental models of reality and social reference points have been contaminated by various “isms” (the only remedy to which is a pseudo-religious conversion and re-programming process). Proportionality becomes conceptually irrelevant in such a model, since everything, no matter how subtle, is “of a piece” with the larger looming menace that include the most severe and terrifying examples. For similar reasons, mitigating variables like individual mental states, personality types, material self-interest, are dismissed as a smokescreen to veil the macro-forces governing people’s actions. To a SJW, a conservative promoting abstinence before marriage is promoting the SAME underlying ideology as a fundamentalist who views women as men’s property. Conversely, a la Peterson, a pink-haired trans activist trying to mandate alternative pronoun use is promoting the SAME underlying ideology as Mao Zedong. Newman: [Trans Activists] could lead to the deaths of millions of people? Peterson:…I’m saying that the philosophy that drives their utterances is the same philosophy that already has driven us to the deaths of millions of people. 2. There’s a phenomena, I think described by Greg Lukianoff and Jonathan Haidt, that shows how as society becomes more equal, the remaining inequalities become increasingly intolerable. This may have to do with how outrage at unfairness is pegged to people’s expectations for what they feel entitled to. When political ideals sanctify equality, and reality doesn’t live up to the promise, the expectation/result mismatch causes people to angrily fixate on the discrepancy, even if in absolute terms, it may be a much smaller discrepancy than previous generations experienced. This is exacerbated by the fact that people tend to frame their value/status rankings in socially comparative, not absolute or objective terms. People care a lot more about how they compare to others, than whether they meet some fixed, abstract standard. This operates on the level of a person’s relative social position to their self-ascribed peer group (the Smiths vs. the Joneses), NOT their position in a normal population distribution, or even a relative historical comparison (living standards of American working class vs. 16th century Aristocracy). Because our concern with social status operates on a dynamic sliding scale calibrated to our immediate proximity and time, we easily lose the far-view perspective that comes from comparing ourselves to more distant reference points, in both proximity and time. In other words, we take things for granted once they become a “new normal”, and are constantly re-adjusting our baseline expectations according to our surrounding social circumstances. Psychologically speaking, most people’s sense of wellbeing and life satisfaction is a function of a drifting, postmodern relativism. This is why a millionaire can feel poor at a billionaire’s birthday party, or a black college student at Yale can feel oppressed by insensitive halloween costumes. The point of the “Boy Who Cried Wolf” story isn’t that there are no wolves. It’s that false positives lead to decreased vigilance. It’s possible to believe that racism, sexism, homophobia, etc are real things with real-life harmful consequences, and still not think that each and every complaint about those things is equally valid or serious. But maybe if you hear enough overblown tales of microaggressions issuing from dubious sources, it might become easier to roll your eyes at tales of aggressions that aren’t so micro; to tell yourself, in effect that there is no such thing as wolves. But it ain’t necessarily so. …well that means you’re 1227% more likely to get killed as an unarmed black person during a routine traffic stop than you are from taking a shower. That sounds a bit different. Frankly, even the math I do there is bad, but that’s sort of the point. If we’re going to have real conversations like this, we can’t use lazy math so we can get the legible impact of a quip about bathtubs without discrediting the position. I initially found this article compelling but had a hard time believing some of the statistical evidence (almost identical numbers of African-Americans and Whites report police interactions as proper!). Given that Salerno’s whole point is to use facts and figures to debunk media myths re: racial bias in police treatment, it is inexcusable for him to screw up the data. If you actually look at the BJS report from which he draws his stats you’ll see that the 83% vs 89% approval numbers he uses refer ONLY to traffic stops. When you look at STREET STOPS, there is huge disparity between Whites and African-Americans as to whether the police behaved properly (78% for whites, 38% for blacks). Likewise, regardless of the overall likelihood of force occurring, it’s strange to use a statistic that Blacks are 2.5 times more likely to have force used against them than Whites as evidence AGAINST racial disparity. Black people struggle with the “am I being paranoid?” problem all the time. The fact that author considers this to be a new or novel perspective simply exemplifies the White Privilege lens that determines his outlook. Most of the time, behavior that’s rooted in racial bias is not overtly racist, and often is not consciously racist. Yet, being on the receiving end of those behaviors, the fourth or fifth time you get pulled over for “driving while black”, or get followed again while shopping, or have some macho acting white dude smile while asking what brings you to his small town while ignoring all the other tourists around you, patterns emerge. Very rarely can you PROVE racist motives, but the effects accumulate. This is why this particular article is so corrosive and insidious, and amounts to a gas lighting attack. It’s hard enough to definitively identify motives. Attacking victims for even trying to do so gives quarter to the racists. This is a good example of why being as specific as possible is helpful here. It may be that police in the United States pull over black motorists when there is no evidence of a crime more often than they do white motorists (this is my assumption) but that they also do not use inappropriate lethal force against black people more often than they do against white people. It also seems very likely that some police forces behave vastly differently with respect to black people and/or use inappropriate lethal force more often than do others. Actually, there was a study committed in New Jersey 15 or so years ago. I also remember reading/hearing about one done in Massachusetts,but I haven’t been able to track it down. Unfortunately, the data isn’t out for public review due to apparent “concerns with methodological issues” that are never described. Which is actually really weird since I have no idea how you could prejudice a blind study like this, except maybe to stick the radars preferentially outside minority community areas? So all we have are unsourced statements on the subject matter which found that apparently, black people just speed more. While I find this rather believable, since the decision of wether to stop a speeding motorist needs to be taken so quickly, and with limited vision of the perpetrator, this is honestly only little better then hearsay right now. Though I do think that I found no competing studies demonstrating the opposite, when the methodology is so simple is indicative. The methodological issues were the three people who looked at the photos to determine each driver’s race. Presumably this less precise than what police do when a driver flies by 30mph over the speed limit. If most everyday, interpersonal racism is so insidious and subtle as to be plausibly deniable, Isn’t one way of dealing with it calling people’s bluff and forcing them to either make it explicit or back off? I understand why this can’t be done with police, but in regular encounters, If you feel you’re being shaded by someone in a passive aggressive way because of racism, can’t you get the upper hand by simply confronting them…especially with sarcastic humor? It’s 2018 – You’ll either embarrass the guy by making his veiled prejudice explicit, or he’ll find it hilarious. A lot of people can break the ice/social tension with people from other backgrounds by making light of stupid stereotypes through ironic self-deprecation. It’s a way of teasing someone for indulging a stereotype while also offering an olive branch in case their motives aren’t malicious. It’s better at filtering out the assholes than the typical shaming tactics that only generate recriminations. >This is why this particular article is so corrosive and insidious, and amounts to a gas lighting attack. It’s hard enough to definitively identify motives. Attacking victims for even trying to do so gives quarter to the racists. Asking important questions is not an attack. You’re being paranoid. This is the problem. If I look back and interpret my interactions with cops from a racist lense I come away with the conclusion there is no other way I could have accumulate so many speeding tickets between the ages of 22 and 32 unless I was targeted on the basis of my race. I managed to get pulled over at least twice every year. The only problem with that conclusion is that my skin is white. Think about that. Without addressing the actual thrust of your argument, your numbers w/r/t racial disparities in the criminal justice system aren’t conclusive at all. You conclude that police don’t hassle black people as much as white people based on one study in which respondents merely anecdotally “describe” their encounters, which is sort of meaningless, and isn’t even persuasive, let alone conclusive, to support the claim that black people are hassled less than white people by police. You cite one additional study and then just state the raw numbers of unarmed black men killed. There is a ton of data on this subject. Again, without discussing the thrust of your argument, your presentation of these cherry-picked numbers as if they’re a fair summary of all the data on discrimination in the criminal justice system is kind of disingenuous and not very intellectually responsible or honest. It almost appears as though you had an argument you wanted to make, so you went and found some numbers that comport with it. You present as if we’re all supposed to read your sliver of data and say WOW, that’s totally convincing, you really summed up all the information out there in an honest and not-at-all confirmation-bias-led way. As if you just settled a huge issue with your three studies. I mean, come on. There’s a ton of data on this subject out there to be examined, considered, and weighed. You don’t at all address the voluminous data that directly conflicts with your assertions, which, given the sheer amount of it, and given the ostensible devotion to “objectivity” that Quillette readers extol and prize, seems both dishonest and ironically similar to the type of data cherry-picking and data manipulation for which the dreaded soldiers of identity politics are frequently (on this very site, among other places) derided. I don’t necessarily disagree with everything in your argument. But I’m certainly concerned with the integrity of your numbers, which seems grossly lacking. You’re extrapolating a lot from a tiny, tiny sample of data in a field in which there is a ton of data contradicting your position. Which, again, is just kind of irresponsible, intellectually. And I know it always plays on Quillette to argue something contra whatever the perceived leftist identity politics position is, if it has no logical integrity, it’s not just benignly useless. It invites the sort of dogmatic generalizing that is neither intelligent, nor productive. It’s also doing a disservice to the whole enterprise. People want to look soberly at data and know the cold, hard facts, because there’s this sense that the leftist identity politics people are misrepresenting the data and using it to advance political agendas, etc. etc. This is all fine. But you have to actually present the data that exists in an honest way for people to soberly look at. You can’t just ignore the data that doesn’t comport with your position. Nor can you support your position with such a flimsy survey of data, which you present as if it’s a representative, summary account. So, while checking paranoia may be a worthy imperative, you should check your sloppy arguments, your data cherry-picking, your hasty generalizations, your grand extrapolations, your failure to consider counterarguments, and your misrepresentation of the state of existing data.